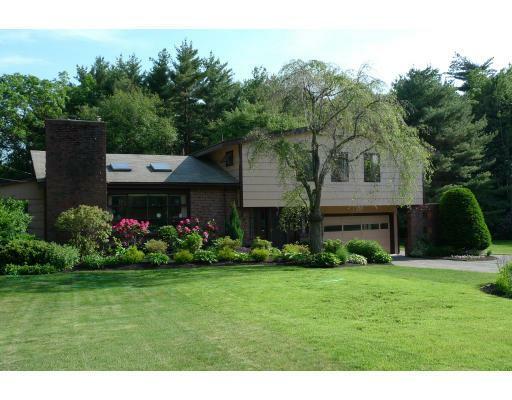 Well cared for multi-level ranch situated on nearly an acre beautifully landscaped lot. Gracious foyer. Dramatic living room & dining room with an open flow features beamed cathedral ceiling w/ skylights, fireplace, & hardwood flrs. Double french doors open to library/sitting room. Spacious master bedroom with double closets & master bath. Huge lower level family room with fireplace, newer wall/wall carpet, w/ built-ins for storage, half bath, walk-out to yard. Potential for in-law suite!